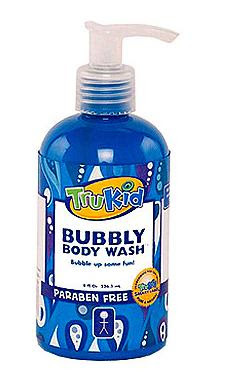 Babblings of a Mommy: TruKid--All Natural Skin Care for Kids. TruKid--All Natural Skin Care for Kids. Tru Kid is an all natural skin care line for kids. Their products are BPA and Phthalate free. They are certified organic and with their natural ingredients being completely SLS, Paraben, 1-4 Dioxane and Gluten-Free! Their shampoo, conditioner, facewash, and all other products come in fun packaging and easy to read symbols for kids. I got to try out their Sunny Days Sunscreen (#1 on Amazon), which in this Florida heat is a daily essential, the Cool Conditioner, Bubbly Body Wash, and Dancing Detangler. My FAVORITE being the Bubbly Body Wash! It smelled fantastic and with only a few drops created a whole bath tub of fun for my munchkin. If you're on the market for natural products for your kids DEFINITELY give TruKid a try. Not only can you buy them through their website but can be conveniently found at your local CVS, Toys R Us, or other major retailers. Price: varies depending on product and retailer. To find out more information or to purchase go to www.trukid.com. Product was provided for review purposes. See disclaimer/disclosure for more info.